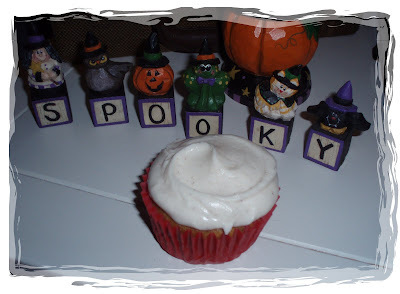 Here's a new pumpkin cupcake recipe I tried out for a football get together today. 1. Preheat oven to 350 degrees. Insert liners into two medium cupcake pans. 2. In a large bowl cream together the butter and sugars with an electric mixer on medium speed until fluffy, 3-5 minutes. Add the eggs to the creamed mixture one at a time, mixing after each addition. Beat well. 3. In a separate bowl combine the flour, baking powder, baking soda, cinnamon, ginger, nutmeg, cloves, and salt. 4. Add the dry ingredients to the creamed mixture, alternating with milk. Mix until completely integrated. 5. Add the pumpkin and vanilla and beat until smooth. 6. Fill the cupcake liners 3/4 full. (You may not have enough batter for all 24 liners.) Bake for 20-25 minutes or until a toothpick inserted in the center of the cupcakes comes out clean. Cool cupcakes in the pan. In a large bowl, on the medium speed of an electric mixer, beat the cream cheese and butter until smooth, 3 minutes. Add the extracts. Combine the cinnamon with the sifted confectioners' sugar in a separate bowl. Gradually add the sugar, 1 cup at a time, beating until smooth and creamy. Cover and refrigerate icing for 1-2 hours, but no longer, to thicken before using.